I'm so sorry about Moose. Purrs to you and your mom. We're so sorry for your loss. Hugs and purrs to you all. I am so sorry for your beloved. Sending purrs to comfort you for this difficult time. I am so sorry. Moose was indeed greeted by yoyr Dad at the Rainbow Bridge. Sending healing light to his family. Please let your mom know that we all send purrs and hugs to her, as she grieves for Moose. He was obviously greatly loved in his short time here on Earth. I am sorry for the loss of Moose. I am sure your dad was there waiting for him. We are so sorry about Moose. Sending lots of purrs to his family...and those who are missing him. We are very sad to hear the news. I am so sorry. He was a handsome boy. Oh dear, we are so, so sorry to hear about that dear boy. It's so sad, but we know the reunion with your Dad was a smile for the hearts. I am so very very sorry for the loss of Sir Moose-a-lot. He was a beautiful boy. Keeping you in my prayers. The poor guy. I am glad he had a brief, shining moment of improvement before the end. I wish it could have lasted much longer. Godspeed, Sir Moose-a-lot. We're so sorry to read of your family's loss. Deep purrs of sympathy to you. We are so sad to read this. We remember you posting about Moosey's weight loss and we were happy to read how he was eating well again after his surgery. We are sending your mother and you lots of heartfelt condolences. 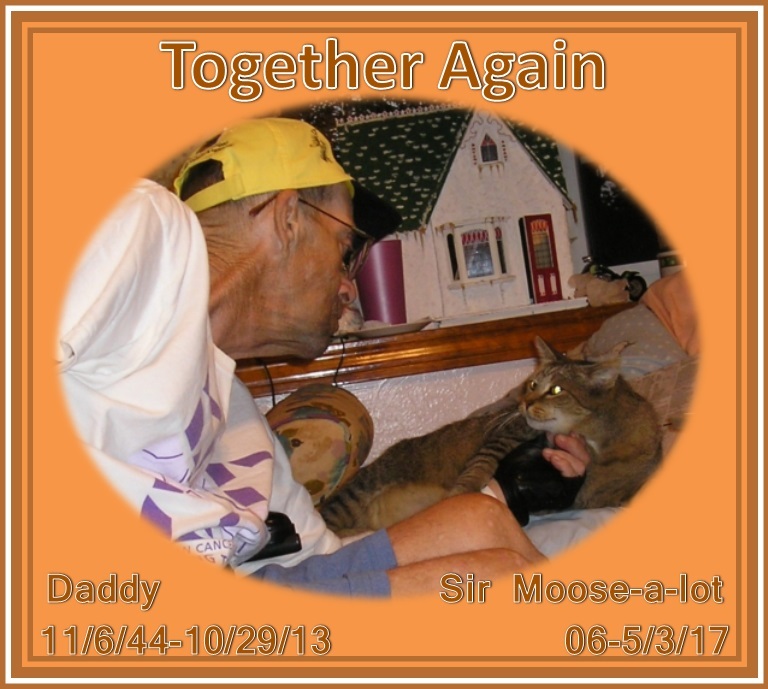 We know your father has Sir Moose next to him now, each of them watching over the other in the afterlife. Rest in peace Sir Moose. You were loved. We are so sorry to hear of Sir Moose-a-lot's journey to the Bridge. We know that our Moosey was there to welcome him. Hugs, purrs and prayers of comfort to you and your mom. We are sending our purrs to your mom and to you too Andrea. We like to think Moose-a-lot is back with his favorite bean.